Gillingham have signed former Northampton Town striker Abebayo Akinfenwa on a initial one-year deal. The 28-year-old was a free agent after failing to agree terms at the Sixfields club, where he scored 17 goals in 40 league appearances last season. The well-travelled striker, who is Gillingham's fourth summer signing, has also played for Watford, Torquay and Swansea, scoring 69 league goals. He is expected to make his debut in Thursday's friendly against Hearts. 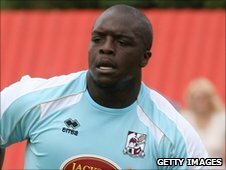 Akinfenwa told BBC Radio Kent: "I spoke to the gaffer a couple of times and bought into what he had to say. His drive, his ambition and what he wanted to do with Gillingham matched my own. "Hopefully, by the grace of God, we will achieve the goals we have set out to achieve." Manager Andy Hessenthaler said: "What he is is what we haven't got, a proven goal scorer. He's a big boy isn't he? He's passed his medical and if you look at him he is pure muscle. He's unbelievable."